Early reports suggest that Canvas, our new online study platform at Sussex, has been well received by students, particularly first years. One of the strengths of Canvas is that students find it easier to stay on top of their studies as a result of notifications keeping them abreast of upcoming events and deadlines. Interestingly, almost half of students have changed their Canvas dashboard to the List view. The List view displays all current module activities with deadlines displayed in chronological order. The Dashboard loads to display the current date, and previous and future dates can be viewed by scrolling up and down the page. In contrast to our students, most tutors still have their dashboard set to use the Card view, which displays a complete list of the modules for which they have a role and is more appropriate for their use of the system. Anecdotally, students have found the most challenging part of Canvas to be the inconsistency between modules. 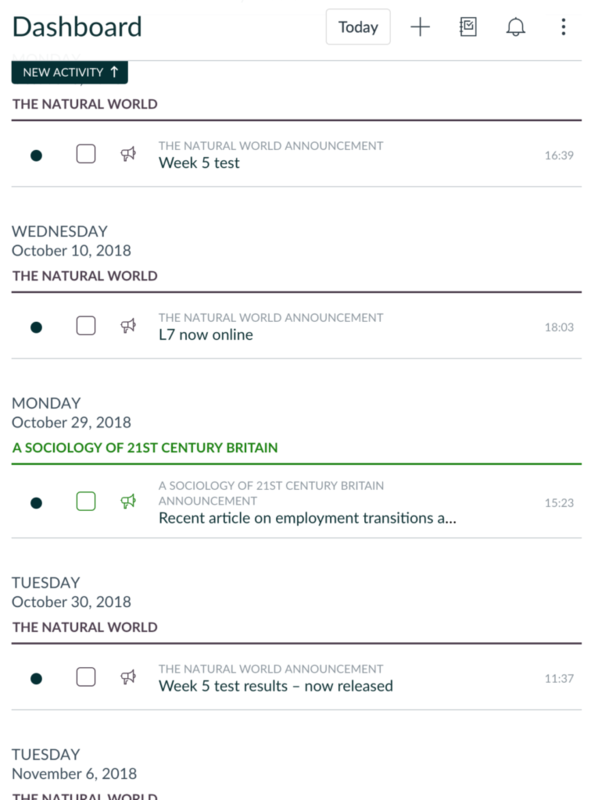 Many tutors have created a home page and have a reduced module navigation menu showing only the links that they are using in their teaching, whilst other tutors have kept the default Units page for their front page and have left the module navigation menu in case students find it useful. In order to increase consistency between modules, Technology Enhanced Learning (TEL) have been asked by some School Directors of Teaching and Learning and Department Heads to create Canvas templates for their school so students get a similar experience in each of their Canvas modules and it is easier for them to find relevant information and learning materials. Digital pedagogy. 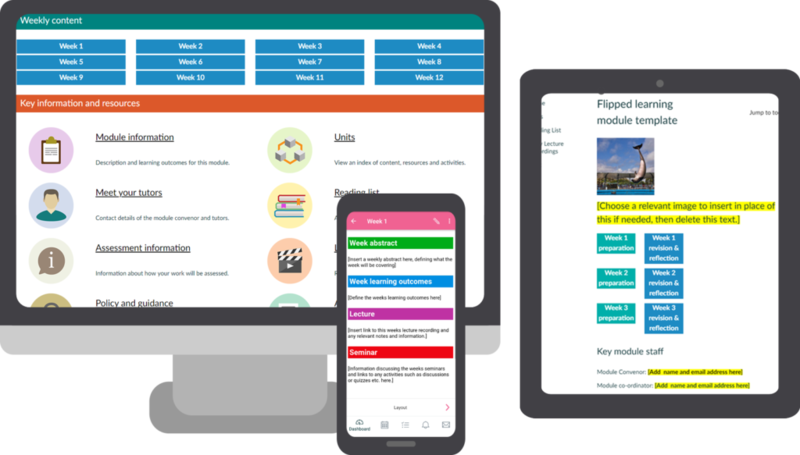 The templates are structured to support module curricula, and for tutors to incorporate topic-based activities and resources which advance the extent to which the students meet the module’s learning objectives. Student experience. The templates are easy to navigate and adhere to the principle that less is often more. They keep the navigation elements to minimum, have a hierarchy of information which makes it easy to find things and have consistency within their design, structure and signposting. Inclusivity. The templates are fully accessible and ensure access to materials is possible from different devices and different software including screen readers. There are currently templates for the the Business School, the School of Engineering and Informatics, the School of English, School of Global Studies, the School Life Sciences, and the Social Work department – some of these just include a home page whilst others provide all the pages you would need for a complete module. Other schools, departments and areas of the University are also planning to introduce templates. You can see these on the Canvas School Templates page of the TEL website. Some areas of the University have not gone down this route and for modules which have not got a set template, TEL have created three templates (so far!) that tutors can choose from to match their teaching style. You can see these on the TEL website. The ‘intuitive’ template is the simplest and most brightly coloured and provides placeholder headings which inform the tutor what content to put where. You will be expected to drop text and files into the appropriate places. The ‘weekly’ template allows the easiest navigation between week pages. It expects tutors to have set up their Talis Aspire reading lists by dividing the readings by week and provides folders for the tutors to organise their own files by week. The ‘flipped learning’ template has been pre-populated with dates in the first three weeks of the Spring semester and for each week includes Units with preparatory materials including learning materials and “readiness” quiz questions, and reflective materials including a journal activity and a revisit to the “readiness” quiz questions to see if the students’ positions have change. The template has a timed release of materials. All the templates are fully responsive and accessible and are designed to allow students an easy and consistent experience when using Canvas. They all work best when starting with an empty site but they all can be used when there is existing content. How can I start using a template? ‹ Adding Requirements & Prerequisites in your Canvas modules.